A friend of ours was walking his dog last week in Marin County and passed a neighbor who was hunched over in pain, shuffling his feet. The neighbor said he was experiencing excruciating pain from a bulging disc in his lower back. Of course, our friend tried to recommend a visit to Sheehan Chiropractic in San Francisco for bulging disc pain to “get his head on straight”, but his neighbor showed his stubbornness by saying that he thought the condition would soon pass so he’d continue using painkillers for a few more weeks. disc” because it has bulged out of its normal position. Located between the vertebrae of the spine, discs provide cushioning and protect the ends of the bones from rubbing against each other. As we age, wear and tear on these disks reduces their size and ability to cushion your vertebrae, which often leads to stiffness and limited range of motion . A bulging spinal disc can occur when the its soft, jellylike center is squeezed into cracks in the disc’s outer covering, weakening and stretching that covering. 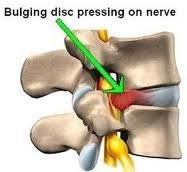 As a disc bulges out from between the neighboring vertebrae, it can press on nerves that travel to the legs or arms and can cause numbness, weakness, or severe, stabbing pain. The good news is that in most cases I’ve seen as a nurse and as a doctor of chiropractic medicine, symptoms of a bulging disc can be managed with nonsurgical treatments and will go away over time. These treatments for San Francisco and Marin County bulging disc pain can include a series of adjustments over 2-3 months at our Sheehan Chiropractic offices, exercises, and other therapies. However, in a few severe cases, surgery may be needed.